Sanganer now is part of greater Jaipur. The River Saraswati is dried up completely and now waste water of the city flows through it. The main resource of water is the ground water which is also receding at alarming rate. Most of the printer’s families have converted their homes into small printing units where printers from Sanganer and nearby villages come and print fabrics. The transition from the traditional dyes to the modern chemical dyes four to five decades back forced the traditional dyers /printers to adapt the new technology with hit and trial method. Most of the printer’s families were uneducated and the dye manufacturing companies too were more interested in selling the products. Though the chemical dyes were manufactured for the organized textile sector, the cottage industries adapted them without much technical knowhow. At present the following styles are been used at the printing units in Sanganer. In this style, dyed ground is removed leaving white or coloured patterns on the original ground by using a various types of reducing agents. Following ground shades are commonly used for getting white and coloured patterns. These all are only for cotton material Rangolite-c is used as reducing agents Rangolite-c is complex compound of formaldehyde and sodium hydro sulphite. Chemically it is a sodium sulphenate of formaldehyde, chemically it is sodium. Sncl2 is also used as reducing agent for printing. Pigments are the organic or inorganic substances insoluble in water and have no affinity for any textile materials. However they are fixed by using a synthetic binder which binds the colored pigments and form a transparent thin film over the fabric. 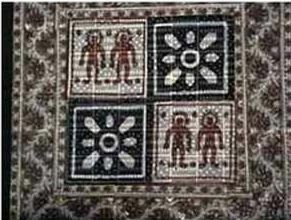 Thus pigment molecules are bound between the binder film and textiles. The rubbing fastness property depends upon the types of binder catalyst used. These classes of soluble vat colors are the best in all round fastness properties. These dyes can be easily mixed with azoic (rapid) dyes and give complete range of colors. Metal printing: Metallic powder is applied to produce a design in gold silver etc. they are printed with synthetic binders such as binder SLN. Khadi Printing: Production of Khadi effect can be brought about by using Titanium dioxide and printing powder. 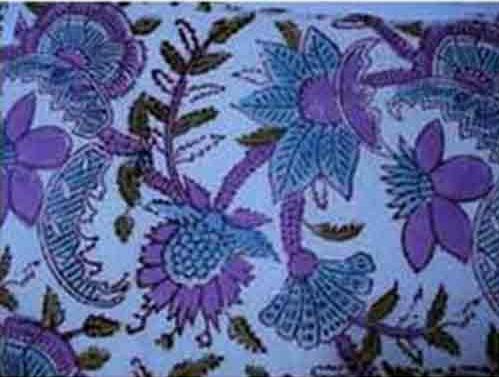 Batik printing: Various designs can be produced first with the molten wax which is the main mechanical resist after the wax become hard. The whole cloth is crumbed to produce crushed effect on the wax portion. 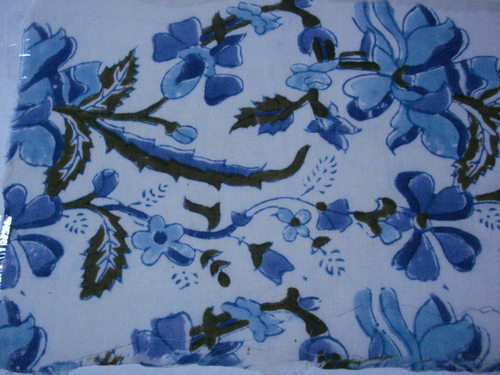 The cloth is dyed with indigo sol vat or azoic colors. The wax is removed by boiling, though this is a very lengthy process but excellent marble effect of various hues can be obtained which is not possible by any methods of printing.